Opening Day for the Welcome Place in Nhlambeni! No Comments on Opening Day for the Welcome Place in Nhlambeni! 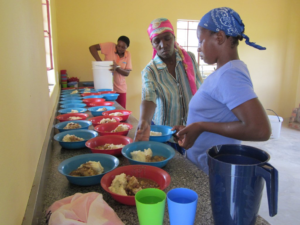 The following letter was written by Lorraine Hope, SOHO Volunteer Nurse and Program Coordinator in Swaziland. Working in country, Lorraine’s days and nights are dedicated to serving the children of Swaziland. Because of contributions from Australia, and you here in the United States, the new Welcome Place in Nhlambeni was opened January 29, 2013. The facility is the second Welcome Place opened by SOHO in Swaziland, the first being the Welcome Place in Mhlosheni. We are deeply grateful for all of you, especially those who supported this project. 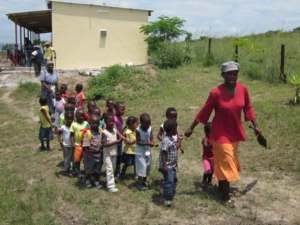 The Welcome Place in Nhlambeni will bring care and new hope to many children who did not have it before. Last week our new Welcome Place at Nhlambeni opened. It was preceded by a very hectic time trying to get the building finished. Heather from Australia came for a month and helped with the painting by day and making teaching aids in the evenings. I can tell you that building in Africa is a challenge while I battled with builders, electricians, plumbers and so on. I have learned a lot – but am not sure if it will ever be used in the future! There is still some work to do on the building but the biggest challenge in getting the grounds landscaped. And a few minor details like getting a truck load of stones for the soak pit. They will be needed once the septic tank fills up and overflows to it. Of course there were also teachers to recruit and train, cooks to recruit and teach how to use the stoves etc. And curriculum to prepare and teaching aids to make. Last Tuesday was Opening Day. It was preceded by some simply horrid weather – no doubt good for the maize – but certainly not for the “road” up to the building. I am not sure it deserved the name road before this – but certainly doesn’t now. The road was causing problems because a tractor had gone up and down but then Monday afternoon a truck load of cement went up to the care point. It was a very large truck and managed to really tear up the road where previously it had been fairly solid – leaving huge holes covered by puddles. The truck then decided to go right into the care point site and turn well past the building – and then of course got stuck in the soft ground and spent the night there. Next morning I came along where previously there had been no problems and got up to my axle in the hole hidden under water. Eventually got pushed out – but other cars got stuck after me. Then they sent an even bigger truck out to pull out the first one. It was so long it could not fit in a part of the road that dipped down and up – and had to have a part of the road chipped out so it could negotiate it. For a while they and the rest of us used a longer, rougher, (but drier) road that wound up and around the hill. Then ALL the cooks went along to school the day of the opening to enroll their own children. I bought bread and jam for breakfast that day, and started preparing lunch with another helper. But we did start on time – although much of the first day was spent calming children who were not sure of school – and generally settling them in. Since then things have calmed down beautifully. We now have 33 children attending – and possibly more to come. The community members are thrilled with the building and think it very beautiful. The kids love the food – and I think are starting to learn something. Many thanks to all of you who have helped with your donations and prayers to make this possible. 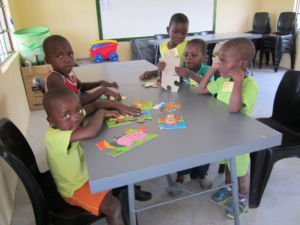 Oh yes – Mhlosheni is going well also – and we are restarting the Tutoring programme again now school is back in.